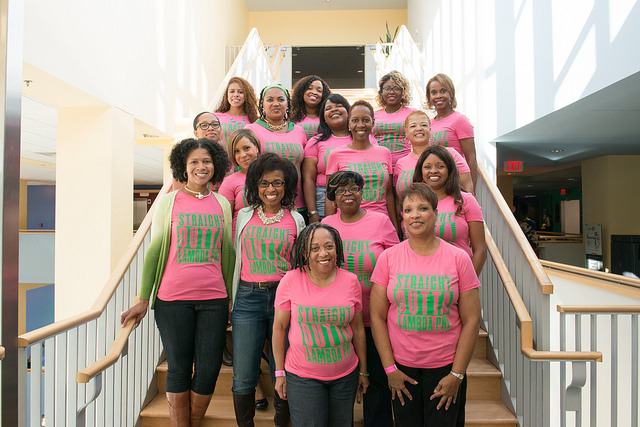 For the past four years, alumnae of UMBC’s Lambda Phi Chapter of Alpha Kappa Alpha (AKA) Sorority, Inc. have been gathering over Homecoming weekend to reconnect and reminisce. For the past three, the event has come with a giving component to benefit the Second Generation Scholarship, which goes to two minority students a year. And in 2015, the alumnae chapter raised $1,585 through their Homecoming programming. The amount has been steadily increasing each year, something Dr. Tamara Lewis ’92, psychology, is very pleased with. A chartering member of UMBC’s Chapter of Black and Latino Alumni, as well as an AKA alumna, she says the Second Generation Scholarship is “a minority scholarship we can all relate to.” She and two other alumnae – Crystal Watkins-Johansson ’95, biological sciences, and Anita Jackson ’80, health science and policy – decided to incorporate the giving component into the event about four years ago. This year’s award went to three recipients: Micahyas Akama ’18, economics, Natacha Olugemo ’17, computer engineering, and Ayana Henderson ’16, biological sciences. Olugemo, who transferred here from Howard Community College and hopes to build a career in network or hardware engineering, says that the financial award has allowed her to focus more on her studies than how she will pay for tuition. She thanks those who gave to the scholarship fund. “You are not just helping us stay in school, you are also helping us build a better future for ourselves and our [families],” she says.